On National Winter Trails Day this past January 8, 2011, we packed up our demo fleet of MSR snowshoes, and headed to Tahoe Meadows to show the masses how great MSR snowshoes are. 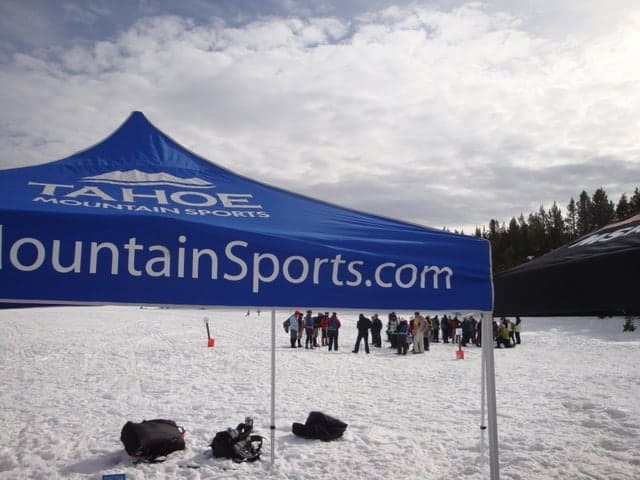 There were 250 participants that day at the Tahoe Rim Trail–sponsored event, and we handed out some 80 free demos! Most who took out demos, did the guided 1-hour hike, so they got a good feel for a variety of terrain, and had plenty of time on the snowshoes. Here’s a video of one of the guided hike’s intros, this one led by Sean of Sierra Nevada Journeys. We had quite a few first-time snowshoers, as well as seasoned snow-hikers looking to go lighter and faster. The top selling points for MSR snowshoes are that they’re lightweight, extremely durable, modular (with flotation tail add-ons for deep snow or heavier-weight users), and made in the USA, in Seattle. Plus, they come in a variety of colors to match your outfit; as you can see from the photo below, we were extra careful to color-coordinate each demo with its user. The bindings shown here are the new set-it-and-forget-it SpeedLocks from MSR. Once you set that toe piece for a particular shoe (like these vintage leather cross-country boots) you’ll never have to refasten it again. 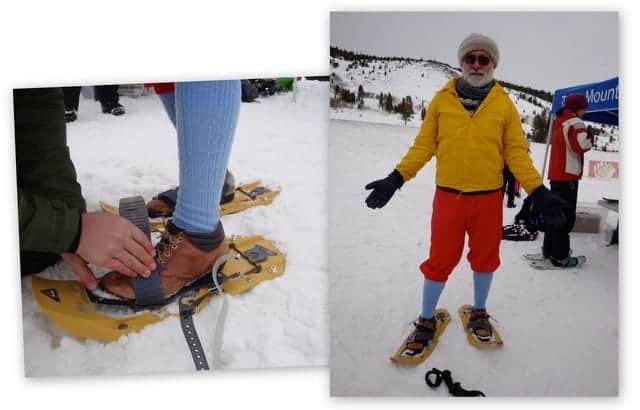 None of our demo participants who had a pair of snowshoes from another brand liked their old pair better! We had quite a few folks stop by already wearing MSR snowshoes, like Kevin Joell of Reno, pictured below. 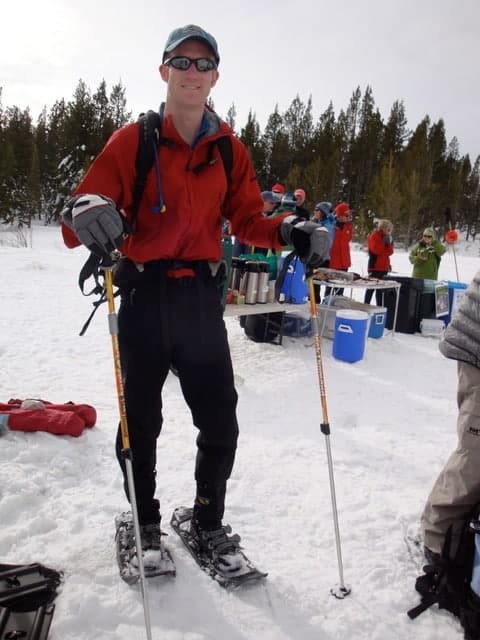 He’s worn his MSR snowshoes on a 5K Winter Xterra snowshoe race and while carrying a pack to go snow camping, and he calls them a great all-around lightweight snowshoe.